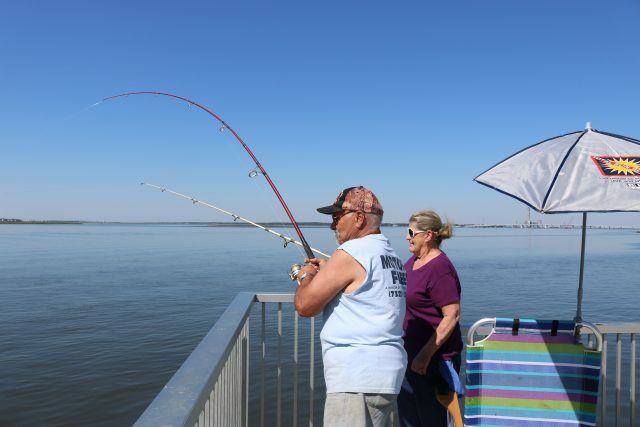 Joe and Shirley Leone, of Dorothy, N.J., enjoy coming to the 9th Street Bridge Fishing Pier. 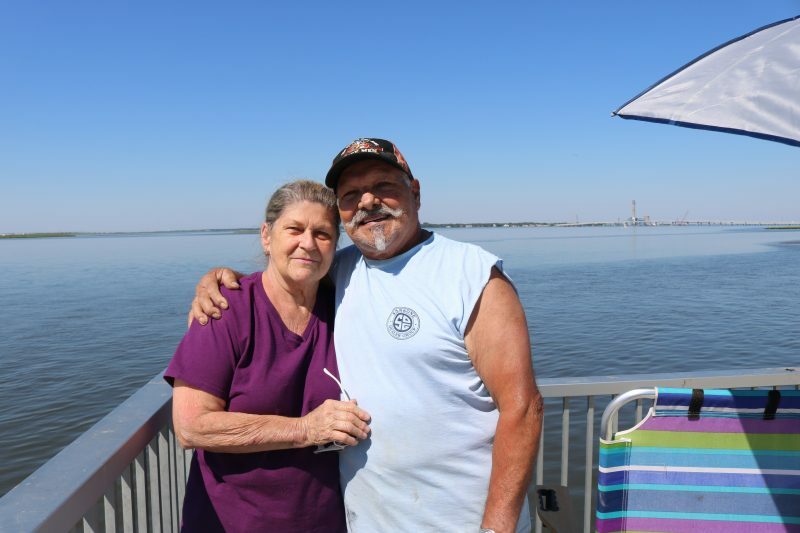 Joe and Shirley Leone had all they needed for a perfect day – two beach chairs complete with umbrellas, ice water, bait and two very well-loved fishing poles. “I’ve been fishing for 55 years. I used to catch a lot of flounder and summer fluke,” Joe Leone said. Shirley Leone spent most of her life freshwater fishing. On Tuesday morning, the Dorothy, N.J., couple spent some relaxing time soaking up the scenery and dropping a hook in the water at the 9th Street Bridge Fishing Pier. 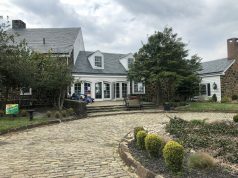 The location is a popular spot for anglers and nature lovers – offering a slice of tranquility just off the busy Route 52 Causeway entering Ocean City. The Leones, who visit the pier a few times during the summer, say it is a peaceful getaway that allows them to enjoy each other’s company and share their love of fishing. The Leones say the bridge fishing pier is a perfect place for them to relax. They dated as teens in 1959 and were reunited and married 12 years ago, when Shirley became a widow and Joe divorced. 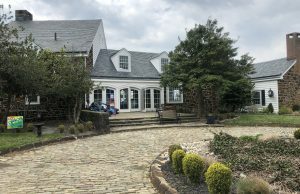 “I never stopped loving her,” Joe Leone said. Their love for each other is not quite matched by their passion for fishing. 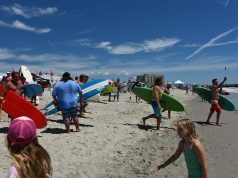 But Joe Leone brought his sweetheart into the word of surf and bay fishing. 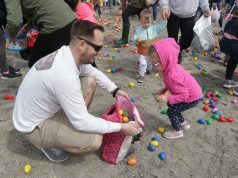 On Tuesday, they were out the door and on the pier by about 9 a.m.
“I think I caught something,” Joe Leone exclaimed while reeling in his line. It wasn’t summer flounder or bass the couple hoped would become supper. Instead, Joe Leone hauled in a hefty helping of seaweed. “We don’t really mind if we don’t catch anything. We hope to. We just love being out here,” Shirley Leone said. 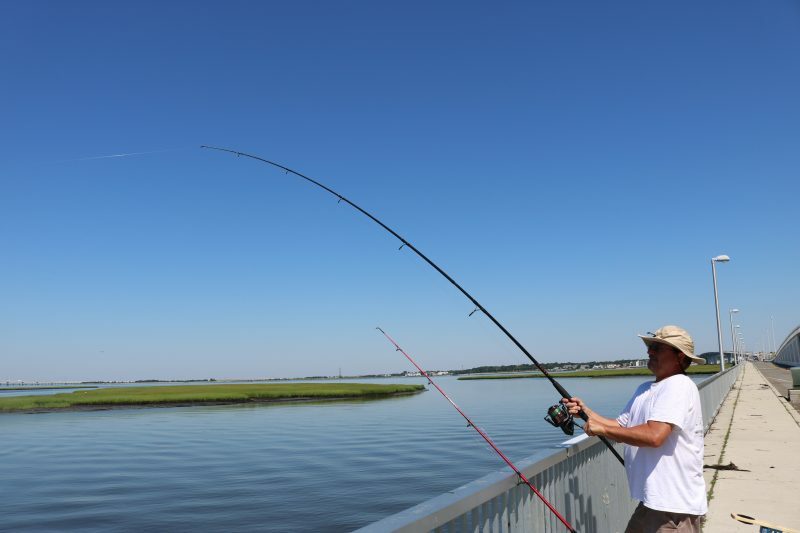 Steve Shultz, of Medford Lakes, vacations in Ocean City and wanted to try out the fishing pier. 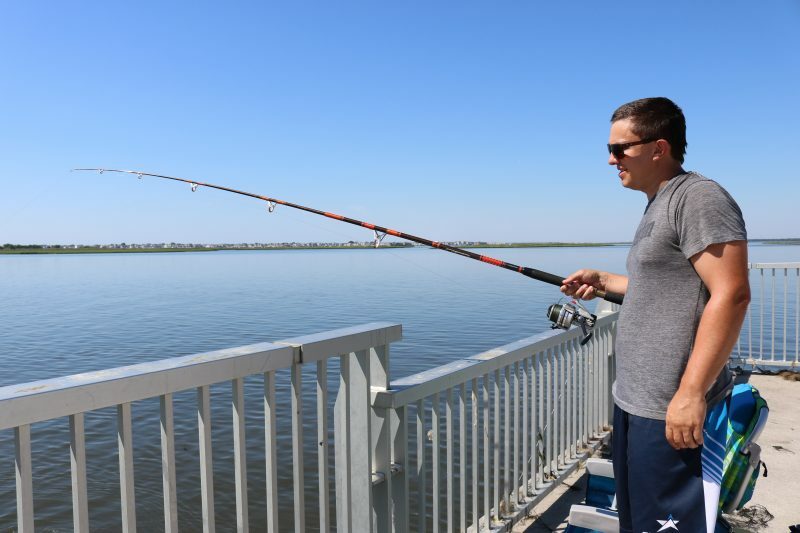 On the far end of the pier, Steve Shultz, 35, a Medford Lakes resident who is vacationing in Ocean City, was geared up and ready for his big catch of the day. The seventh grade science teacher knew a bit about the tides, had the right bait – minnows, which he said works for him – and some dark shades to block out some of the rays from the scorching sun as temperatures climbed to near 90 degrees Tuesday. He has even brought his son, Roarke, 6, and daughter, Hadley, 5, into the sport. “They really like it,” he said. 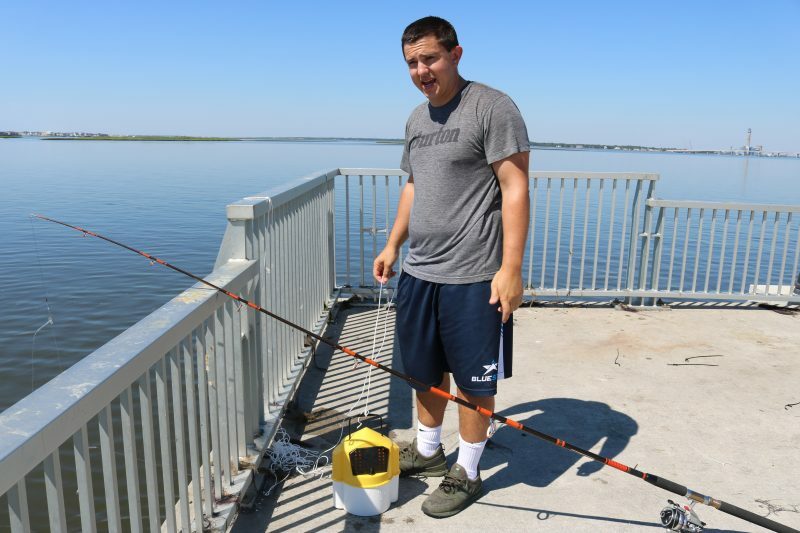 But the kids were in camp Tuesday, so Shultz headed to the bridge fishing pier for the first time. Steve Shultz says he has luck when he uses minnows as bait. 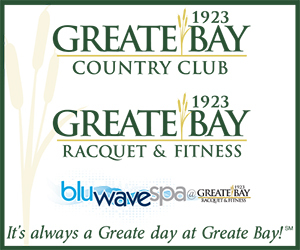 “I passed the bridge’s fishing pier signs and wanted to check it out. It’s beautiful. But bay fishing is a lot different than lake fishing, though. You don’t have to worry about the tides on the lake,” Shultz said with a chuckle as he cast his line. Later, he checked his bait after a seaweed catch. He attached a fresh minnow on the hook and tossed his line back into the bay. Fishermen from experts to novices seemed to enjoy their time on the pier. A handful of people claimed a spot, set down a bucket and made it their own – at least for the morning. Dan Ostash, of Bucks County, says he has caught a lot of fish in the bay. Dan Ostash, of Bucks County, Pa., who vacations in Ocean City, is a regular at the fishing pier. He also does a lot of surf fishing. He said he has caught a lot of fish over the years. One of his secrets is synthetic bait. But that didn’t seem to be the way the morning was working out. It was still early. Ostash, who is such an avid fisherman, said he is teaching his grandchildren how to fish and they really seem to like it. 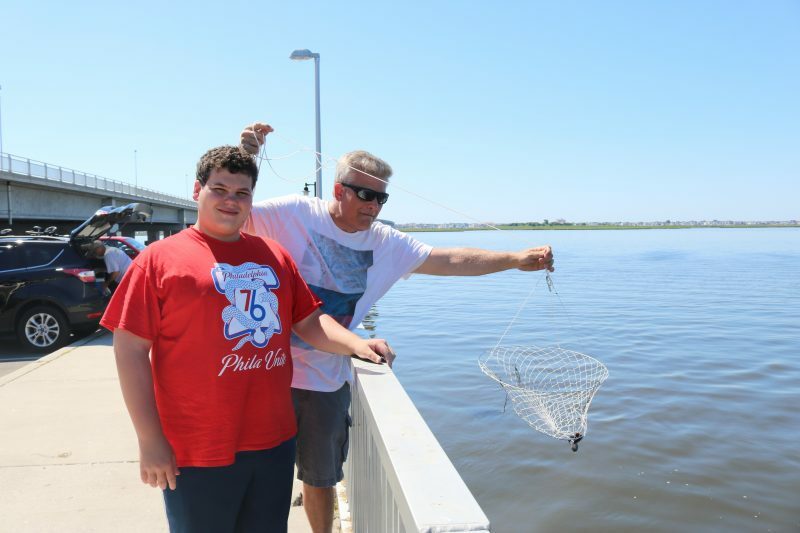 Daniel Weissert, 16, (left) and his dad Richard Weissert, both of Maryland, head to the 9th Street Bridge Fishing Pier every summer vacation. The father-son team at the pier Tuesday morning had a plan – enjoy their day. If they catch something, that would be terrific, too. 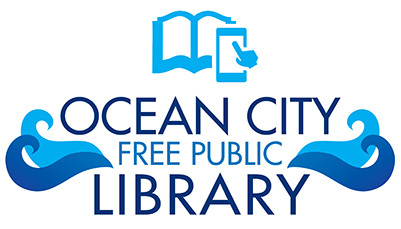 Richard Weissert and his son, Daniel, 16, vacationing in Ocean City from Maryland, had a bucket of water, fish heads and a net. They placed a bass head in a crabbing net and guided it carefully into the waters. Daniel Weissert said he really likes the quality time with his dad and likes crabbing more than fishing.